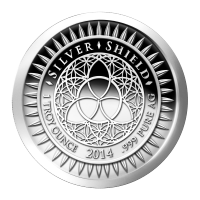 The new 2014 Silver Shield Reverse shows the evolution of the original Silver Bullet Silver Shield series with it's original 47 bullets and shield to the later introduction of the trivium into the 2013 Reverse. Now the 2014 Silver Shield fully embraces the Trivium design that made it's first appearance in 2012 and has made it's way into several subsequent releases like Freedom Girl and Sic Semper Tyrannis. The 47 bullets remain as symbol of the atomic number of silver. The overall clean design shows the maturity of the brand and message. The first release of the new Silver Shield Series will be also the last of the Silver Bullet Silver Shield series with the New Years coin. This unique double Reverse design not only marks the transition of years, but also the two brands. This first release will use the 2013 SBSS reverse and the new 2014 Silver Shield Reverse. This round will come in a branded box with a certificate of authenticity and a coin capsule. מטבע כסף New Year's במצב כ-Proof שנת 2014 משקל אונקיה Here is what Chris Duane has to say about this bridge between the series: The new 2014 Silver Shield Reverse shows the evolution of the original Silver Bullet Silver Shield series with it's original 47 bullets and shield to the later introduction of the trivium into the 2013 Reverse. Now the 2014 Silver Shield fully embraces the Trivium design that made it's first appearance in 2012 and has made it's way into several subsequent releases like Freedom Girl and Sic Semper Tyrannis. The 47 bullets remain as symbol of the atomic number of silver. The overall clean design shows the maturity of the brand and message. The first release of the new Silver Shield Series will be also the last of the Silver Bullet Silver Shield series with the New Years coin. This unique double Reverse design not only marks the transition of years, but also the two brands. This first release will use the 2013 SBSS reverse and the new 2014 Silver Shield Reverse.